Maj. Gen. Adeyemi Yekini, the commander in charge of the newly launched operation WHIRL STROKE, on Friday, said troops of the Nigerian military will ‘‘kill both the cattle and the herdsmen’’ in the course of their operation in Benue, Nasarawa, Taraba and Zamfara states. Yekini, while speaking to journalists today in Makurdi, said troops of the operation WHIRL STROKE are committed to ending the incessant killings in the crisis-ravaged states in the country. 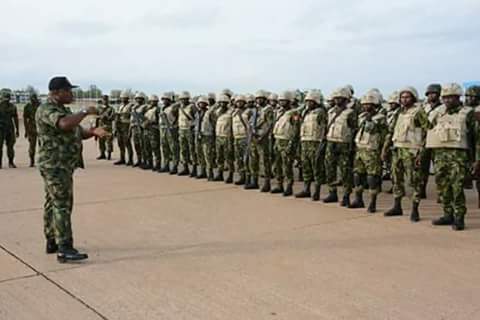 The Force Commander said the military has already begun making arrests of both Benue indigenes and Fulani herdsmen who were found disturbing the peace of the people in the state. “It is a special mission to pursue, track, find and destroy. Any armed man or armed group that is here to cause evil is an enemy. 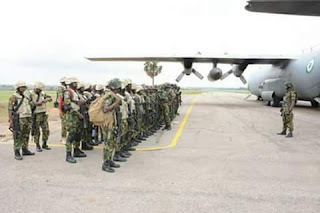 We are here to put an end to incessant killing and we have no agenda beyond that,” Yekini said while fielding questions during a press briefing staged by Acting Director Defence Information, Brig-Gen John Agim. “We have made arrests of indigenes of Benue leading attacks. They are from Benue and they live in Benue. We have also arrested quite a number of herdsmen too, up to 147, who are undergoing prosecution. “In this operation, we will find, fix, and we will strike them wherever they may be. We will bombard them, and once we have evidence that the camps are possible hideouts for criminal elements, we will bombard them. I have enough men, enough resources, to fish out the criminals and destroy them. On his part, Brig. Gen. Agim said the launch of the operation WHIRL STROKE was informed by the need for the military to re-strategise and put an end to the never-ending killings in troubled states of the country.